VATICAN CITY (CNS) — As the rich get richer, the increasing misery and cries of the poor are ignored every day, Pope Francis said. “We Christians cannot stand with arms folded in indifference” or thrown up in the air in helpless resignation, the pope said in his homily Nov. 18, the World Day of the Poor. “As believers, we must stretch out our hands as Jesus does with us,” freely and lovingly offering help to the poor and all those in need, the pope said at the Mass in St. Peter’s Basilica. About 6,000 poor people attended the Mass as special guests; they were joined by volunteers and others who assist disadvantaged communities. 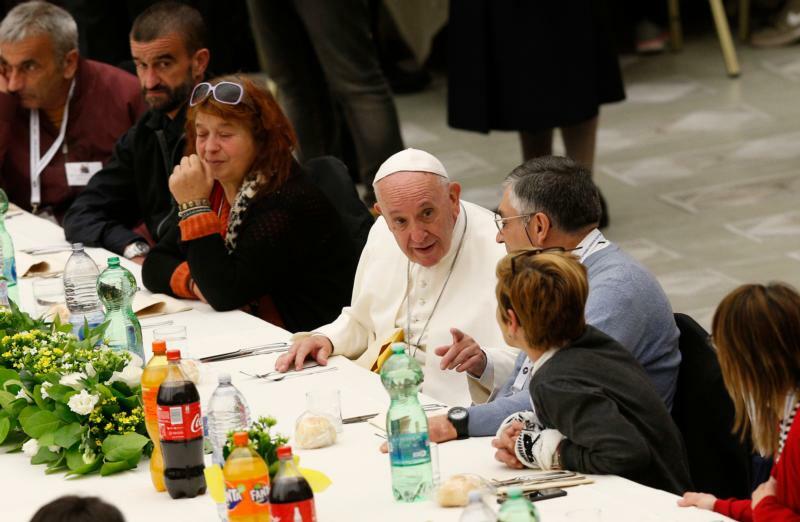 After the Mass and Angelus, the pope joined some 1,500 poor people in the Vatican’s audience hall for a multi-course lunch. Many parishes, schools and volunteer groups across Rome also offered a number of services and meals for the poor that day. May people hear the cry of the abandoned elderly, those who lack any support, refugees and “entire peoples deprived even of the great natural resources at their disposal,” he said. Every day, he said, the cry of the poor becomes louder, but it is increasingly ignored. Their cries are “drowned out by the din of the rich few, who grow ever fewer and more rich,” he said. The pope reflected on St. Matthew’s account of what Jesus did after he fed thousands with just five loaves and two fish. The passage (Mt 14: 22-32) explains that instead of gloating or basking in the glory of successfully feeding so many people, Jesus goes up to the mountain to pray. “He teaches us the courage to leave, to leave behind the success that swells the heart and the tranquillity that deadens the soul,” the pope said. “This is the road Jesus tells us to take — to go up to God and to come down to our brothers and sisters,” to tear oneself away from a life of ease and comfort and leave behind fleeting pleasures, glories and superfluous possessions, the pope said. Jesus sets people free from the things that do not matter so they will be able to embrace the true treasures in life: God and one’s neighbor, he added. The secret to navigating life and its momentary storms, the pope said, “is to invite Jesus on board. The rudder of life must be surrendered to him” because it is he who gives life, hope, healing and freedom from fear. “This is the beginning of faith — to cast off the pride that makes us feel self-sufficient and to realize that we are in need of salvation,” he said. “Faith grows in this climate” of being not on a pedestal aloof from the world but with those crying for help. “This is why it is important for all of us to live our faith in contact with those in need,” the pope said. “This is not a sociological option or a pontifical fad. It is a theological requirement” to acknowledge one’s own spiritual poverty and that everyone, especially the poor, is pleading for salvation. “Rouse us, Lord, from our idle calm, from the quiet lull of our safe harbors. Set us free from the moorings of self-absorption that weigh life down; free us from constantly seeking success. Teach us to know how to ‘leave’ in order to set out on the road you have shown us: to God and our neighbor,” he said. U.N. groups estimate there are some 700 million people in the world who are unable to meet their basic needs and that 10 percent of the world’s population lives in extreme poverty.